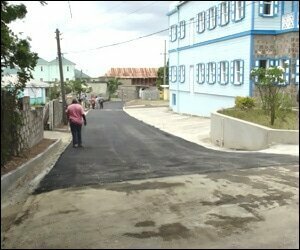 Featherbed Alley in Charlestown is the most recent public road constructed in the Ministry of Communications and Works small road enhancement projects. The Public Works Department (PWD) commenced work on the 300-feet-long-13 Â½ feet-wide road on March 24, 2016 and was completed on April 01, 2016. During an update on the project on April 01, 2016, Permanent Secretary in the Ministry of Communications and Works Ernie Stapleton used the opportunity to congratulate the workers for their efforts. “I must first of all commend him [PWD] Director Raoul Pemberton and his team for doing a fantastic job. “This road is a small road but it is a road that would enhance the traffic flow in the area and would improve the vicinity where persons would use this area to access various business places in Charlestown and I must commend them for a job well done,”Â he said. Pemberton, who was on hand during the visit, gave some detail on how the department tackled the Featherbed Alley project. He considered the road works there as significant. According to the director, the team worked throughout the Easter holidays to complete drainage work, layout and preparation for the foundation. The asphalting was done on the last day. He commended them for their dedication and tireless work. He noted that the road was a small one because it is an existing road and they could only use the available space. “Usually when we undertake road construction we look for a minimum of 16 feet but because of the constraints that we had in this area we had to take the width that was available to us,”Â he said. Meantime, Pemberton outlined some of the other ongoing road projects the department is engaged in and what it has planned for 2016. “In addition to this project, the Public Works Department is currently undertaking works in the Newcastle area, just off Shaws Road. We are also doing significant work in Farms area, Cane Garden, in addition to the Hanley’s Road project. We have a few other roads in the pipeline,”Â he said.